Don't you love quick projects? I'm a huge fan of anything that can be sewn up in under an hour. As we get closer to the frenzy of gift giving opportunities that lasts from the end of spring through the beginning of summer, it's nice to have a few tricks up my sleeve. This key pouch pattern has been coming together in my mind over the past few days, and my sister's birthday tomorrow seemed like the perfect occasion to try it out. I pulled some black and white fabrics along with two favorite prints that I've been saving for a special occasion: Sea Flowers from Out to Sea by Sarah Jane and Polly Goes to Paris by Henry Glass. I threw in some pink Aurifil thread for a fun accent. There are slots on the front for any plastic you need to carry with you, a zipper pouch on the side for cash, and a twill tape loop for your key chain. Throw in an Anthropologie gift card, and I'd say we've got a birthday present. Several hours of sorting, moving furniture, and filling a black trash bag to the brim has yielded what feels like a brand new sewing room. My threads are now up on a shelf where they won't be in danger of falling over every time my sewing table gets bumped. Fabrics are once again neatly sorted by color in the cabinet beside my subtle shrine to Diet Coke. And I've finally hung my portable design wall up on the actual wall where it's now showcasing my envelope blocks from Patchwork, Please! Those of you following me on Instagram have seen a few of these, and I've been able to do more in the past week. I'm taking some of the blocks from that book and putting them together in what I'm calling a Desktop Medallion Quilt. It's been fun to tackle a long term project again, watching all the pieces come together a bit at a time. 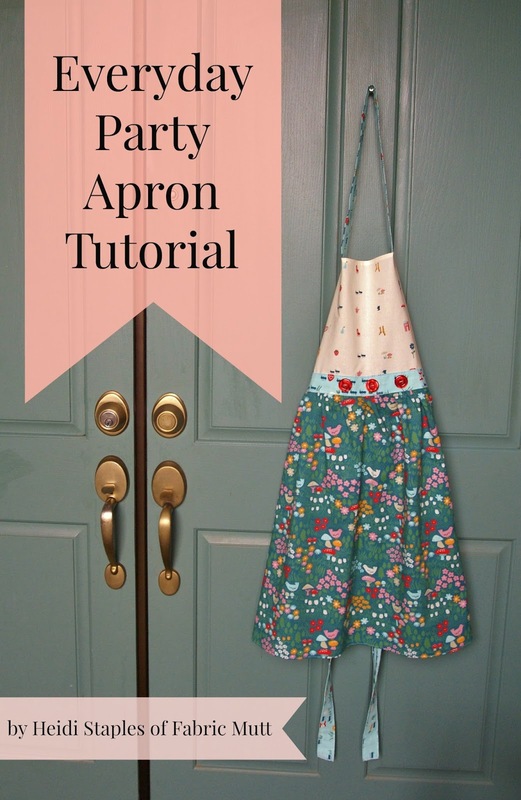 For those of you who didn't see the post on Instagram, be sure to stop by the Birch Fabrics blog to see my Everyday Party Apron Tutorial. It's a quick project and might just help you get in the spring cleaning mood yourself. If you make one, be sure to send me a photo or tag me @fabricmutt on Instagram. Every year I look forward to the Umbrella Prints Trimmings Competition. It's not about the prizes really. It's about the challenge of taking these little leftover pieces of fabric and turning them into something new. Working with scraps is always a welcome reminder that the ragged pieces of my life can become something beautiful if I let them, but I had no idea how personal this year's project would turn out to be. My husband woke me on Wednesday morning to say that my grandmother's assisted living home had called with the news that Grandma was unresponsive. Paramedics arrived, found that her heart had stopped, and resuscitated her. We ended up sitting beside her in a hospital room where she was unconscious and breathing heavily, not knowing whether she would last the next hour or another six months. Mom and I decided that we would spend the night with her, so I went home to pack a bag. I had decided to try a hexagon project this year with my Umbrella Prints trimmings, and it seemed like a good idea to tuck them into a sewing kit and bring them along to keep my hands busy. I will always remember April 2, 2014 as one of the longest nights of my life. Mom and I sat together in that dimly lit hospital room, keeping a quiet vigil over my grandmother, and it felt as though we lived through a week instead of just hours. We talked and cried, prayed and listened and cried some more. I read your sweet Instagram comments to my mother, and we were both encouraged (thank you, dear friends). I basted my hexagons, laid them out in a pattern, and spent at least an hour rearranging them over and over again on a little table in the corner of the room. Mom held Grandma's hand, reassuring her now and then that it was okay to let go, that we loved her. Through it all, we saw the signs that death was coming closer. As her seizures gave way to peaceful breathing and her heartbeat began to slow down, we set everything aside to focus on my grandmother, to love and pray her through the doorway between life and death. She drew her last breath shortly after noon on April 3rd. It took me several days to be able to pick up this project again. The feelings from that night were still so raw that I almost couldn't bear opening my sewing kit and staring them in the face. In the end, I decided that finishing this pillow might just be my own way of finding some healing and closure. I added two hexagons made from Japanese prints to the ones from my trimmings packet -- one including the word "life." It seemed appropriate. The hexagons were sewn together by hand and stitched down onto a background of chocolate brown linen by machine. I added one hexagon to the back of the pillow which reminds me slightly of a sun coming up over the horizon. The pillow now sits on the loveseat in my parents' room, a gift to my dear mother who has been amazing through all of this. As many of you know, my grandmother moved into a nearby assisted living home this past December and quickly went downhill under the debilitating influence of dementia, but when I started sewing and blogging several years ago, she was one of my biggest cheerleaders. It was Grandma who often slipped some money into my hand when I came to visit her, insisting, "Buy yourself some new fabric, Heidi Jean!" (Have I mentioned that Grandma's first name was Jean?) She loved to send me pictures of quilts, asking if I could make the same thing for her, and she insisted on buying me a subscription to Mollie Makes so that I could keep up on the latest inspiration. I think she probably drove people crazy showing them printouts from my blog and pointing out my quilts which she had displayed all over her house. Her gifts and encouragement helped me keep this blog going, especially in those early days, and I wouldn't be where I am if it weren't for her. Goodbye for a little while, Grandma. We love you.